Soil scientists have struggled with accurately measuring water flow through soil for years. Even the smallest soil details can sway water's path from the straight, sequential line gravity alone might demand. These minute differences contribute to water's "preferential flow." For farmers' crops dependent on moisture, or chemical spills needing containment, preferential flow can be a matter of life or death. "Water bypasses a portion of the soil...and leads to faster and deeper water flow (in other areas) than what might be typically expected," says Henry Lin. Lin is a professor in the Department of Ecosystem Science and Management at Pennsylvania State University, and the lead researcher of a recent study on preferential flow. Lin notes this flow of water through soil "controls a variety of soil's physical, chemical, and biological functions." It affects the environment in many ways. Locally, preferential flow affects how much water soils can store, how soils retain nutrients, and how agricultural chemicals move through soil. It also affects soil's ability to filter and the stability of the landscape. On this small scale, pathways include root channels, animal burrows, cracks in dry soil, and spaces between soil aggregates. On a larger scale, preferential flow affects the entire water cycle—the continuous movement of water among the oceans, air, and land. Topography, vegetation and other complexities become important. Lin's study aimed to address some of the technological challenges associated with measuring preferential flow. In particular, the study examined methods to scale up observations from the smallest, basic unit of soil to the larger landscape. Lin says that most previous field studies have disturbed the soil and provided one-time results. Techniques that don't disturb the soil are becoming more popular. These methods provide a big picture, but can miss fine details. 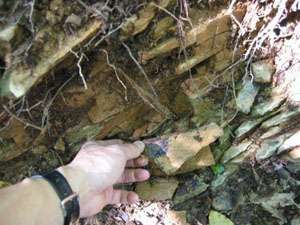 Lin's group, aided by technology, pursued a novel approach to measuring preferential flow in the Shale Hills Catchment area of central Pennsylvania. Researchers installed soil moisture sensors at various locations, from the surface all the way to the boundary between soil and bedrock. The sensors connect together in a computer-monitored network for periodic, automatic measurements. An initial study looked at 3 years of soil moisture data and 175 precipitation events. The current study expands the analysis to 412 events over 6.5 years. This allows a broader comparison of seasonal data. It also includes 25 sites beyond the 10 from the original research. Lin found the unique water patterns depended small-scale elements. "It was the interplay between landform units and soil types, coupled with initial soil moisture and precipitation features, that determined the initiation and persistence of preferential flow," Lin says. Lin discovered "hot spots" and "hot moments" in water flow. For example, dry soils toward the top of a slope and wet soils at the bottom showed greater occurrence of preferential flow. South-facing slopes also had more compared to north-facing ones. The valley floor and swales near the stream also had a greater chance of preferential flow occurrence than the middle of hill slopes. Intense precipitation also increased preferential flow. 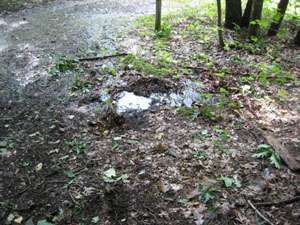 The soil-monitoring network also revealed a hidden flow pattern beneath the soil surface. Lin describes these as both structured and dynamic. "Pathways may be linked via a series of nodes in a network, which may be switched on or off and expand or shrink depending on local soil moisture conditions, rainfall inputs, and plant activities," Lin says. "With time, these networks may self-organize, thus forming temporally stable...pathways." Lin describes two areas for future research into preferential flow. First, he says, studies must "go beyond classical small-scale physics" and provide a meaningful method for scaling up small-scale observations over large areas. Second, researchers must find ways to overcome the challenges associated with measuring and mapping preferential flow as it happens in the landscape. Lin hopes researchers worldwide will use these techniques. This could contribute to a wider understanding of how water flows across diverse landscapes.